Don't you ever think of certain brands and say to yourself that they might just not be your your age-group? Well with Lancôme I always saw it for the more mature ladies with regards to aging believe it or not. Obviously since i'm in my 20's going on 22 in just under 4 months is abit scary actually and I do feel that I need to start taking care of my skin much more than my teen years. 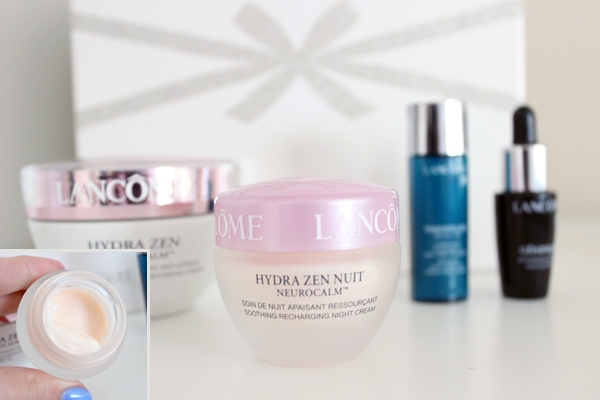 Just days after I was determined to find the best skincare products to start with, I was approached to try out this gorgeous Lancôme Skincare Gift Set from Harrods. Without a doubt I jumped at the chance to and was a happy bunny indeed. The Lovely Gift Set comes in a beautiful White and Silver Glittery Box. The packaging is so gorgeous that I just couldn't stop staring at it when I received it. The detail in the silver glittery ribbon with a bow was just the cherry on the top. Any lucky person would love to have received this as a gift for Christmas or even a Birthday Present. 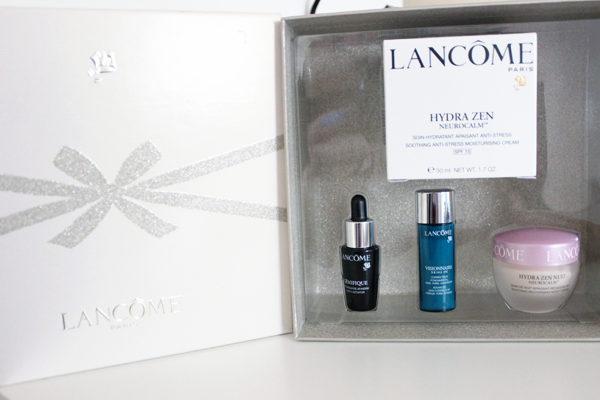 The Lancôme Skincare Gift Box retails for just £38* and inside was a Full Size Lancôme Hydra Zen Neurocalm Soothing Anti-Stress Moisturising Cream with SPF15 (50ml), Lancôme Hydra Zen Neurocalm Night Cream (15ml), Lancôme Visionnaire Advanced Skin Corrector (7ml) and Lancôme Genifique Youth Activator (7ml). The main product in the Gift Set is the Full sized 50ml Lancôme Hydra Zen Neurocalm Day with SPF15 £39 which is packaged in a beautiful jar with a pink top. The fresh Rose scent has been taken from "Rose de France, Mu Dan Po and Moringa Extracts." The moisturiser itself can be used on all skin types and it is said to give hydration to skin that is dehydrated and lost it's glow. I have been using this every morning before applying my makeup and I have seen that my makeup has been gliding onto the skin smoother. Also it does state that the skin should feel softer and smoother after a couple of days and indeed it did. I don't have the best of skin as I do have certain dry patches in some areas and it has cleared after a couple of days. Since it does in fact have an SPF15 this would be great for those who live in a hot climate. I know for a fact that my mother would be very interested in this for back home (MALTA) where many always look for an SPF inside their moisturisers. With it being such a large jar I know for a fact that this will last me quite a number of months as you do not need alot of the product for one application. 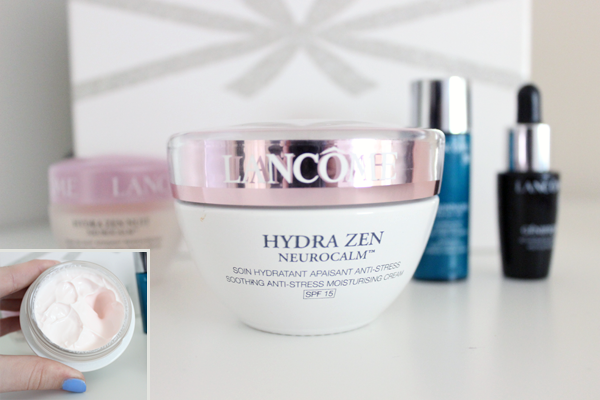 Next up is the Lancôme Hydra Zen Neurocalm Night Cream £41 which sadly is nearly gone being is that you get a smaller jar. Night Creams are generally more intense and rich in texture and are usually the key cream to every skincare regime. This in fact recharges your skin during the night time. Waking up in the morning, I always feel refreshes and touching my skin it sure did make a huge difference as my skin started to feel smoother and softer and full of life rather than dullness. I had this dry patch right by my nose which was bugging me and I made sure I covered that with some of the night cream before bed and after a couple of days it did diminish the dry skin. 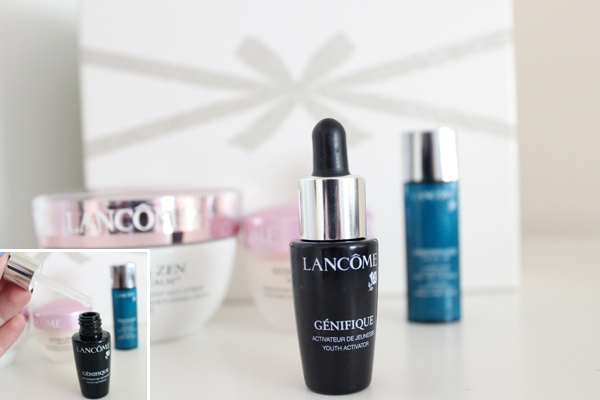 Lastly in the Gift Set are TWO High-End Lancôme product samples that I have heard and seen mixed reviews on. They are well known and best sellers from the brand itself and generated a lot of hype. Some might be a bit hesitant to purchase due to their high-end price ranges as the Genifique Youth Activator ranges between £58-£92 as there are different volumes of the bottle to choose from (30ml,50ml and 75ml). Lancôme Genifique Youth Activator £58-£92 is an invisible serum that you put on prior to any creams. It states that it will restore the youthfulness back into the skin and reduce lines and wrinkles on the skin. What I saw was that with this product my skin did feel nice and silky after applying it to my skin and left a radiant sheen with a softer look. I would feel it would be more suited for mature ladies who would like to get some radiance back into the skin. This will hydrate the skin, plumping the skin and improving the skins elasticity. 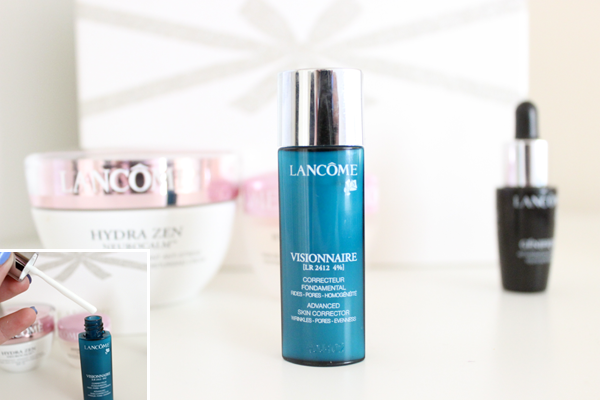 Lancôme Visionnaire Advanced Skin Corrector £82 is a white serum for all skin types and is said to help diminish fine lines, takes away skin imperfections and appear reduced and also pores look tightened on the skin. This is a product I used at night with only just a little drop can cover a whole face. In a couple of days, I have seen such a magnificent difference in my complexion as it has evened out my skintone quite nicely and also my pores have diminished especially around my nose area where I tend to get the most. I was really impressed with this product as it does in fact correct the skin and evens out the skintone. I generally love the idea of Gift Sets as you can easily try alot of products from a range at a fraction of the price and decide if you do want to fork out on purchasing full-sized products to use in your daily skin care regime. This Lancôme set would be ideal for your Mum, Sister or even Grandmother as it would be a great Christmas present for under the tree who want to try out a new skin care range as it is specialised for all skin types. I LOVE CHRISTMAS GIFT SETS! 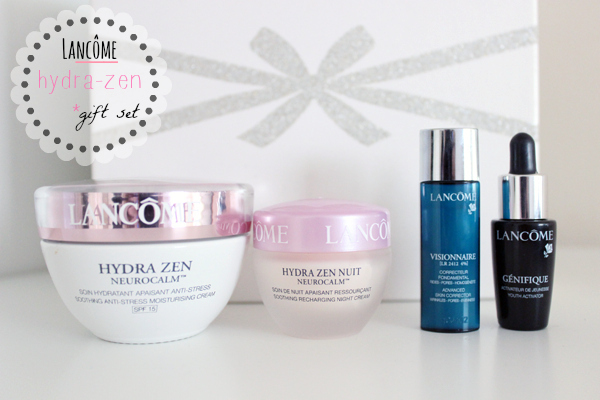 HAVE YOU TRIED LANCôME'S SKIN CARE RANGE BEFORE? SHARE YOUR THOUGHTS AND LET ME KNOW IN THE COMMENTS SECTION! @Christina, don't you just see a brand and say, well that's not for my age group!! But I was really surprised and really pleased with the products! Barry m are one of my favourite brands, they're great value for money and I think they're underhyped! All their products are good. but their nail polishs win the top spot for me! Amaaaazing!